Immunogen :Anti-FOXO3 antibody was raised against an 18 amino acid synthetic peptide near the amino terminus of human FOXO3. 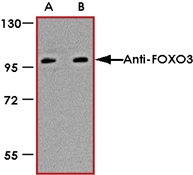 Sample Data :Western blot analysis of FOXO3 in A-20 cell lysate with Anti-FOXO3 antibody at (A) 0.5 ug/mL and (B) 1 μg/mL. 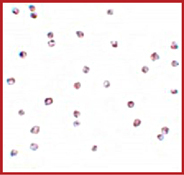 Sample Data :Immunocytochemistry of FOXO3 in A-20 cells with Anti-FOXO3 antibody at 4 ug/mL. Scientific Background :FOXO3 is a ubiquitously expressed 75 kDa protein member of a subfamily of the forkhead homeotic gene family of transcription factors and shuttles between the cytoplasm and nucleus. FOXO transcription factors are key players of cell fate decisions, metabolism, stress resistance, tumor suppression and are regulated by growth factors, oxidative stress or nutrient deprivation. FOXO3 is involved with mTOR in the regulation of autophagy in skeletal muscle, and activates protein degradation in atrophying muscle cells. FOXO3 has also been implicated in several neurodegenerative disorders including aging, neuromuscular disease, systemic lupus erythmatosus, stroke and diabetic complications. 1. Anderson MJ, Viars CS, Czekay S, et al. Cloning and characterization of three human forkhead genes that comprise an FKHR-like gene subfamily. Genomics1998; 47:187-99. 2. Greer EL and Brunet A. FOXO transcription factors at the interface between longevity and tumor suppression. Oncogene2005; 24:7410-25. 3. Mammucari C, Schiaffino S, and Sandri M. Downstream of Akt: FoxO3 and mTOR in the regulation of autophagy in skeletal muscle. Autophagy2008; 4:524-6. 4. Zhao J, Brault JJ, Schild A, et al. FoxO3 coordinately activates protein degradation by the autophagic/lysosomal and proteasomal pathways in atrophying muscle cells. Cell Metab.2007; 6:472-83.